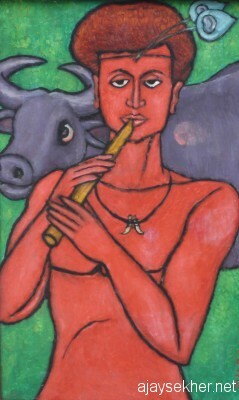 A cowherd is playing the flute, leaning onto a human like buffalo. The Channar woman with a brave heart defends herself against the heinous attackers who try to strip her in public. The cosmic dance of the lord is done over a dark and animalized body of the racial and religious other. A woman cuts off her breasts as the monarchy and priestly patriarchy sit dumb. The shadow of a modern sage is rendered as the image of an ancient reformer. 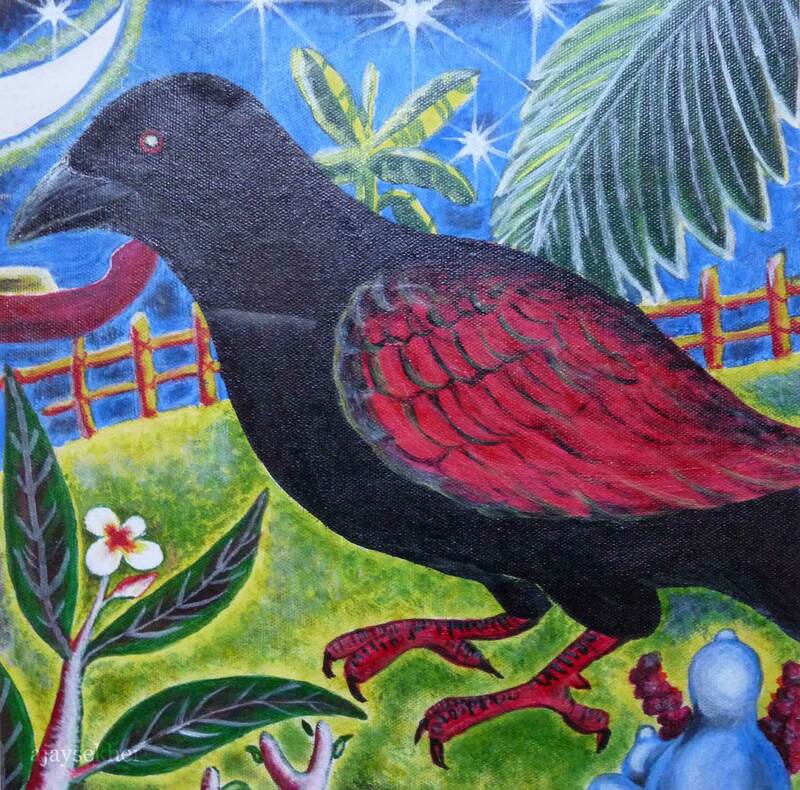 The images and visual narratives in the paintings of Chitrakaran T Murali are articulate and contrapuntal. 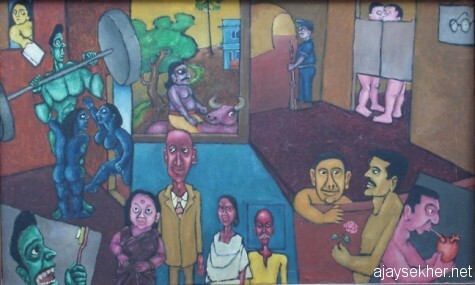 Murali’s paintings have emerged as serious cultural critiques of Kerala history and society in myriad ways. 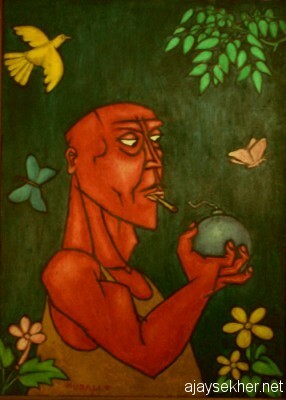 Through the visual depiction of hegemony and cultural elitism in subversive ways on the canvas in acrylic and mixed media his art practice and unique political aesthetics have provided a vantage and perspective for critically and ethically rethinking the past and present of Kerala and its composite culture. 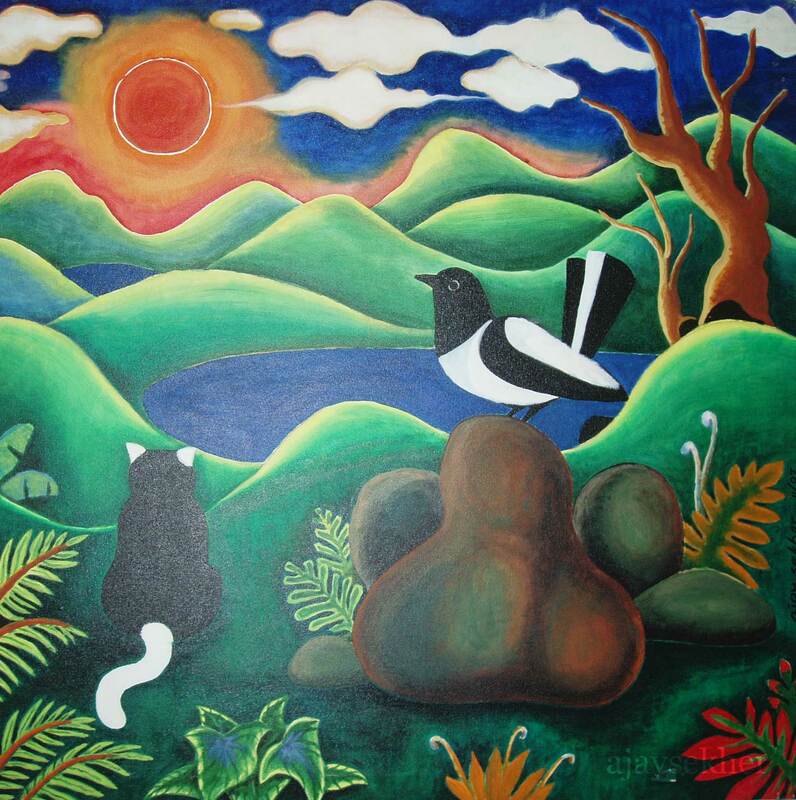 T Murali hailing from Malapuram district of Kerala became renowned as Chitrakaran or the painter through his illustrations and drawings in various popular periodicals including the Matrubhumi group of publications. 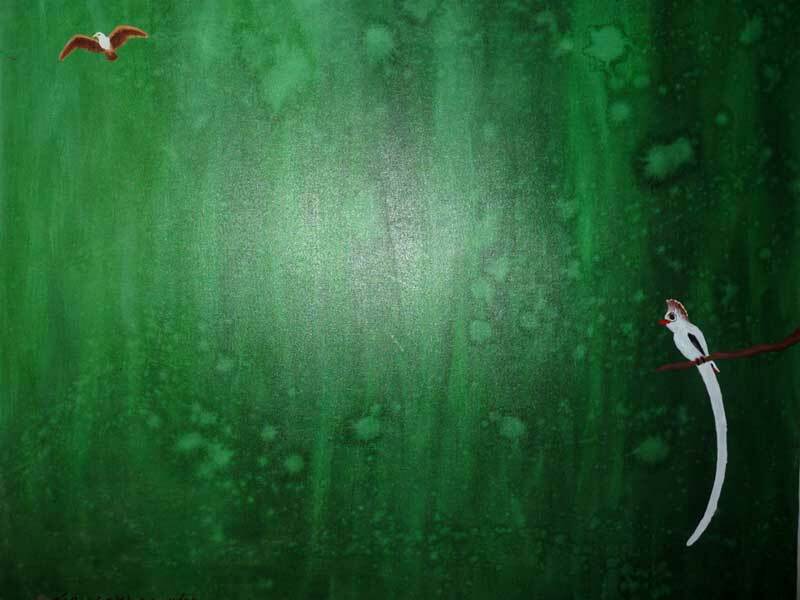 Later he established his own art institution that deals with commercial art and advertisement in Kannur. Along with this endeavors he has also successfully continued his creative and critical fine arts practice and has produced dozens of canvases that specifically engage with the visual culture and social history of Kerala. The critical content and counter hegemonic thrust of his paintings are remarkable and distinct. Unlike the popular and celebrated artists who romanticized and exoticized the elite aspects and the Savarna visual imagery, Murali has scathingly critiqued and resisted the hegemonic hangover of Brahmanical and Savarna aspects of our semiology and cosmology. His works strategically questioned and challenged the Vamana and Padaja ideology and discourse in the cultural history and polity of Kerala. He has also recovered defiant voices of resistance and subaltern speech in Kerala history like the sacrifice of Nangeli at the Mulachiparambu of Cherthala. Nangeli cut off both her breasts and presented it before the tax collector of the Travancore state in a plantain leaf before the lighted traditional lamp or Nila Vilaku in true conventional but subversive way. This paramount sacrifice by a brave Avarna woman forced the caste ridden regime to withdraw its infamous Mula Karam or breast tax. 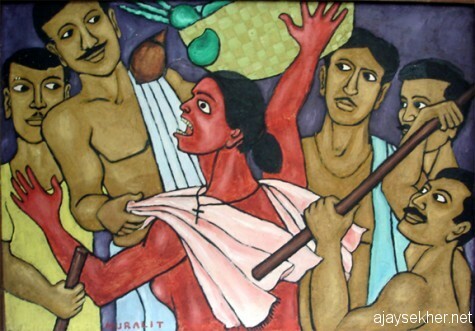 With extreme poise and subtle sensibility Murali has depicted this immortal act of talking back by the Ezhava woman in south central Kerala against priestly monarchy, caste feudalism and Brahmanic patriarchy. Chitrakaran has also visited the place in Chertala and has presented a replica of the painting to the relatives of Nangeli near Mulachi Parambu. It is also vital to remember that Kandapan her husband who immolated himself in her pyre has also created another history as the first recorded incident of male Sati or widower sacrifice. It is also remarkable that his paintings vernacularize the meta-narratives of Hindutva and provincialize the icons like Krishna. 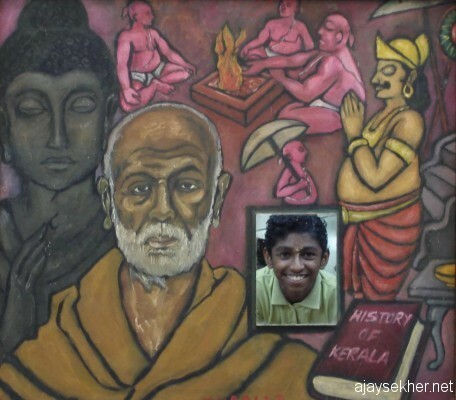 His work on Kerala history presents Narayana Guru as a modern day Boddhisatva akin to Gautama Buddha, providing stark parallels to the verses of Sahodaran Ayyappan who coined the poetic phrase “Narayana Buddha” in early 20th century at the heyday of Kerala renaissance struggles. His visual critique of the cosmic dance of Siva that is done by stamping down a dark and dwarf demonic figure at the feet and the Travancore dynasty are insightful and enlightening. Murali’s rendering and subaltern appropriation of the image of Krishna as a buffalo boy with a reed is illuminating and emancipating. In such strategic subversion and iconic twists Chitrakaran educates and liberates the people in emancipating ways. 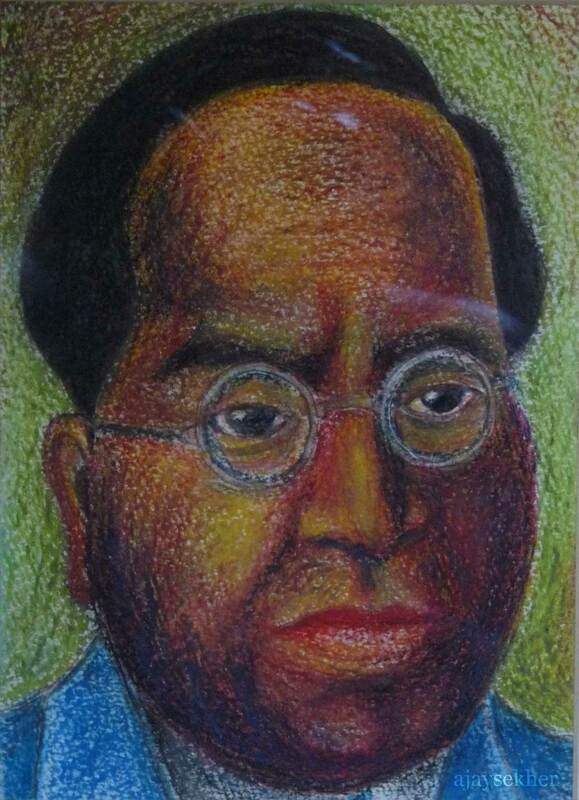 There are popular aspects of mimicry, irony, caricature and visual satire in his strokes. He improvises with tone and texture to create an appealing visual and formal effect in dexterous ways. 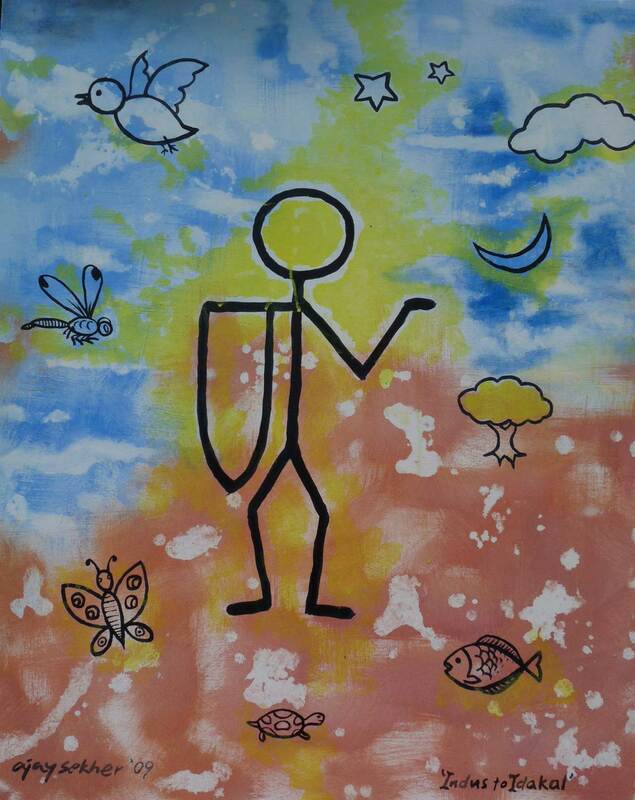 Paintings like Channar woman and Kerala History are deeply engrossing to every sensitive being in our society. 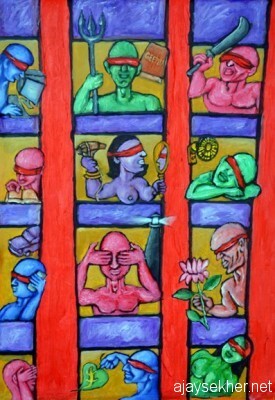 These paintings are also tributes and critiques of Kerala renaissance and Kerala modernity in multiple ways. They trace the erasures and repressions that dominate the mainstream soceity and the Savarna Hindu common sense that monopolize every sites in the present. They also try to build up a parallel referential structure of dalit bahujan semiotics and imagery that can decolonize and de-Hinduize the Avarna people in Kerala and India. It is also remarkable that his paintings create inter textual linkages with the works of dalit bahujan writers and theorists like Ialaiah, Omvedt or Guru. 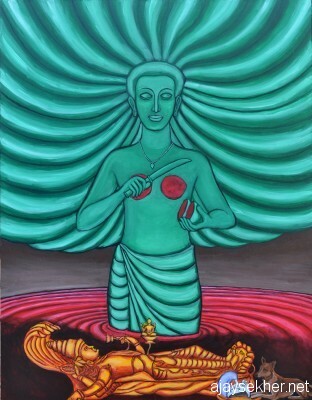 The visual critique of Chitrakaran is also deeply sensitive, sensual, ethical and spiritual. They create an earthiness in sensual perception through the use of muddy and organic hues. The color tone and decentered visual treatment of the subjects are empowering and democratic at large. 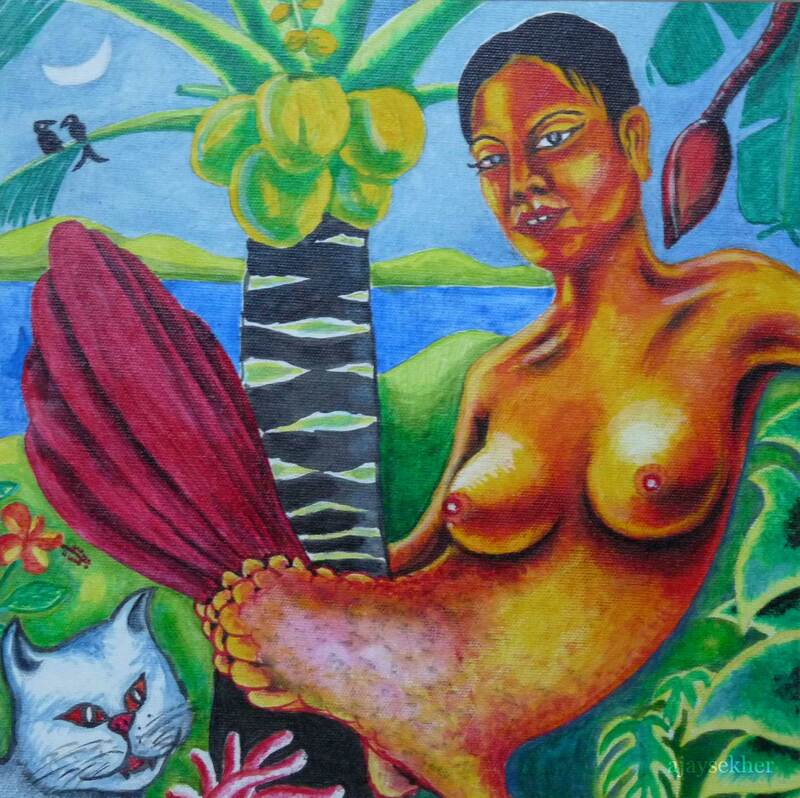 The human figures and bodies emancipate and spiritually engender the viewer and the passing onlooker with an organic gut feeling and deep rooted bio politics. 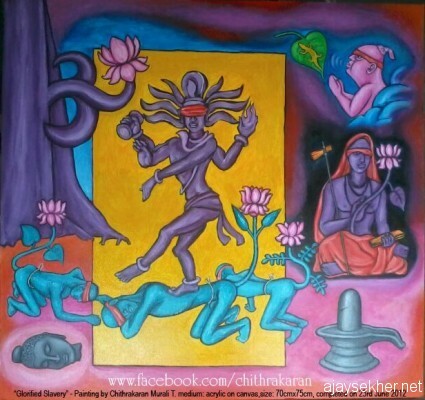 Chitrakaran T Murali’s artful acts systematically deconstruct and undo the hegemonic visual narratives in our temple murals or in the elitist art practices that are popularized by the mainstream media and academia through a sustained sense of subversion and critical and creative renewal. They are powerful narratives in visual cultural politcs and therefore are able to lure the popular gaze in a lingering fashion. 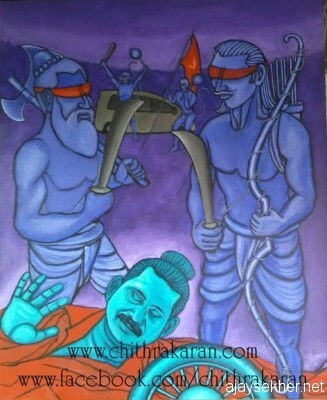 The paintings of Murali is certainly going to captivate and guide the people in the times to come as fascism and fanaticism of various kinds are trying to appropriate, manipulate and mutilate the public art practices and visual culture in several hidden ways. 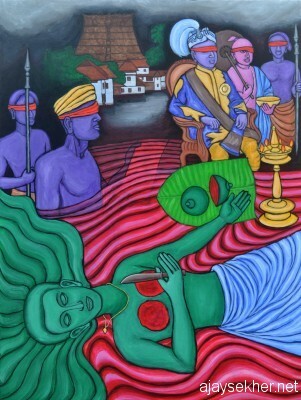 This entry was posted in Cultural Politics and tagged breast tax in Kerala history, Cherthala, Chithrakaran t Murali, Chitrakaran, Chitrakaran T Murali, cultural politics in Kerala, Kandapan and the first male sati, Kerala and Breast tax, Kerala painting, Mulachiparambu, Mulakaram in Kerala, nangeli and mulakkaram, Nangeli of Cherthala, painting on breast tax in Kerala, painting on nangeli, painting on Sambuka, paintings on Channar revolt, Paintings on culture ans socety o Kerala, panting on Krisha by Chitrakaran, visual critique of Kerala culture and society, visual cultural politics in Kerala, visual culture in Kerala on March 28, 2013 by Ajay.